Is There Something Wrong With Technorati? 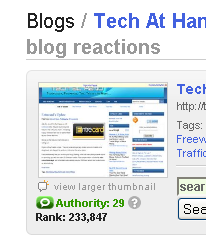 Technorati is one of the site which I frequently visit, but just today I have seen a big drop at my stats. Yesterday my stats is somewhere below 20,000 but today I have seen that my rank goes to 233,847 which is very far from yesterday. 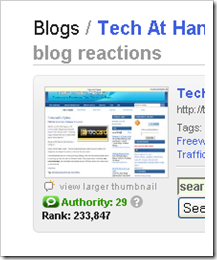 I know that I have been penalized by Google but do Technorati also penalized a blog ? What I know about Technorati is, it is based on the # of links directed to your site and not because of PR from the last 6 months. And I know that my links where added little by little and not just one load in a day. Well I don’t know what is happening in Technorati. Does anybody noticed the same or I am just one of the lucky blogger to have this. Well just asking. Yup.. If the basis of payment is Technorati ranking we should do something to put it up. Dexter | Tech At Hand Dot Nets last blog post..How To Install New Fonts in Computer ? I used to have a good ranking in Technorati but lately it also goes down. It is good if you are using it for pay to blog because some of them need your site to have a good ranking aside from alexa and PR but if not then why worry.